Part IV: Afghanistan: Defend the cities! Download pdf or read online. Afghanistan’s “Great Saur Revolution”, in April 1978, and the Russian invasion of Afghanistan that flowed from it 20 months later, at Christmas 1979, were two of the most important events of the second half of the 20th century. Just after Christmas 1979, 100,000 soldiers of the Russian army occupied Afghanistan. Five and a half years later the Afghans are still putting up an unquellable resistance. Most of the Trotskyist organisations backed the Russians. Socialist Organiser was the only organisation in the entire “orthodox Trotskyist” political spectrum that condemned the Russian invasion and called for the troops to be withdrawn. Afghanistan is one of the most backward countries on earth. Its population about 16 million. National income per head is less than $150 a year. Between one and two million people were nomads even before the Russian invasion created four million refugees. What characterises Bolshevism on the national question is that in its attitude towards oppressed nations, even the most backward, it considers them not only the object but also the subject of politics. The Russian bureaucracy and their Afghan supporters are in effect carrying through the tasks of the bourgeois democratic revolution in that country”, says Woods — though they are doing it in a “distorted”, Bonapartist fashion. The same idea is expressed by Grant in his 1978 article: the “proletarian Bonapartist” regimes “carry out in backward countries the historic job which was carried out by the bourgeoisie in the capitalist countries in the past”. For nine years, the army and air force of the bureaucratic ruling class of the Soviet Union waged a brutal war of conquest against the peoples of Afghanistan. They napalmed villages and burned the crops in the fields. They devastated the countryside, wrecked the primitive economy, and drove as many as five million refugees — one quarter of the entire population — over the borders into Pakistan and Iran. What is the attitude of Marxists to "backward" and "underdeveloped" countries and peoples who are being assaulted, occupied, or colonised by a more advanced but predatory civilisation? 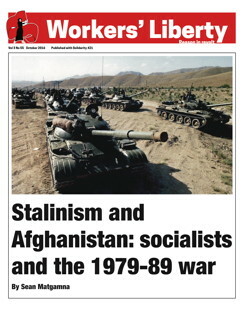 When the Russians invaded Afghanistan In December 1979, almost every “orthodox Trotskyist” group in the world supported them, or at any rate refused to call for their withdrawal. Some were wildly enthusiastic for a while. A big part of the so-called “United Secretariat of the Fourth International”, grouped around the Socialist Workers’ Party of the USA, hailed the Russians as “going to the aid of the Afghan revolution”.